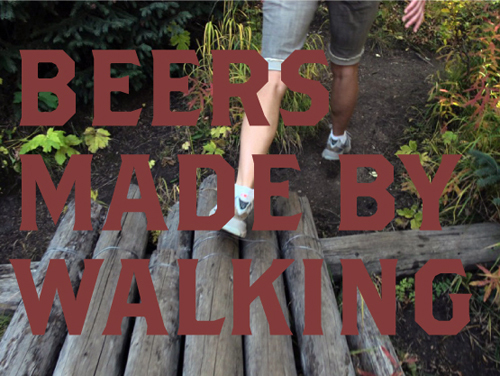 Two weeks ago we completed our sixth Beers Made By Walking hike. The program is a summer long series where we identify edible plants on a hike and make a beer based off what we see on that particular trail. The brewer that came along on this day was Tom Brown, he was a homebrewer when we started this project but ended up getting a job at Trinity in the middle of it, so he’s technically the only commerical brewer in the group. The beer has already been made up at Pikes Peak Brewing, it is a commercial product (not homebrew) and will be available for one night, Oct 29th, at Brewer’s Republic downtown Colorado Springs. In this case, Trinity Brewing ended up donating all the base ingredients for the beer. Thank you Trinity! The naturalist that helped us identify plants on this hike was Paul Gayer, an ecology student at CSU Ft. Collins. This time we did the Catamount Trail Hike, in Green Mountain Falls, which lasted about 6 hours. The hike goes up about 2000 feet in a short distance so it proved to be our most strenuous hike of the series. The setting was a little higher in altitude so while the leaves in Colorado Springs were just barely turning yellow, pretty much the entire backdrop of this trail was dark red, orange, and yellow leaves, a sign that autumn is well on it’s way (and there’s no question about that now, even in Colorado Springs’ limits). At the top of the mountain we entered an area called ‘The Garden of Eden.’ A little stream passed by the trail before beginning its descent. This area would be really nice to see at various times of the year. We saw plants that were in various stages of fall, but I imagine in the spring and summer, when everything is in bloom, this would be even more extraordinary than it already was. After walking a ways through the Garden of Eden we came to a road. We knew the reservoir was nearby so we followed the road and there it was, with Pikes Peak in the background. Many people were out fishing that day. It was a hot day and we had walked a good distance so we hung out for a while, identified a couple more plants, and ate our lunch before heading back down the mountain. Out of all the hikes we’ve done this summer, the view from the reservoir was probably the most rewarding moment. Tom’s beer was brewed at Pikes Peak in Monument this weekend. He’s calling it Eve’s Forbidden Flower, due in part to our passing through the Garden of Eden and because he’s used different flowers. Out of all the brewer’s, he has used the most adjunct ingredients in his beer. So, his beer will be a Saison, with bee plant, tansy mustard, rose hips, and amaranth. Additionally he used wild hops from Manitou, as well as 5 gallons of stream water from the waterfall in the top photo. He was also going to use Evening Primrose but we couldn’t find a place that could supply it to us in time. But, this should still prove interesting. I don’t know how the mustard will taste in the end, but I can say that I have never had a beer that had mustard in it. I am looking forward to it. You can try Tom’s beer, along with three other beers on Oct 29th at Brewer’s Republic. The beers will be served on a handmade tray. Here are photos of the first tasting event. Thank you again to Trinity for the donated ingredients, and to Pikes Peak Brewing for brewing the beer with us! Lastly, thank you to GOCA, who is the main sponsor of this program.